The Beijing World Robot Conference (WRC), sponsored by Beijing City, the Ministry of Industry and Information Technology, and the China Association of Science and Technology, was held October 21-25. It was big, long, ran over a weekend and gave a run-down of the breath of China’s fast-emerging robotics industry. More than 145 vendors filled the exhibition hall which was separated into international and domestic industrial robots, and service and special purpose robots. In the main forum, 45 sessions comprising individual and panel presentations took place in the main auditorium with seating for 1,000 over three of the five days of the event. Rodney Brooks described how collaborative robots are helping bring flexibility to electronics manufacturing; KUKA’s Bernd Liepert described how manufacturing benefits through the use of robotics; and IBM’s Grady Booch and many others discussed the future of AI in relation to robots, manufacturing, self-driving cars and cloud processing and connectedness; to name just a few of the Western speakers. 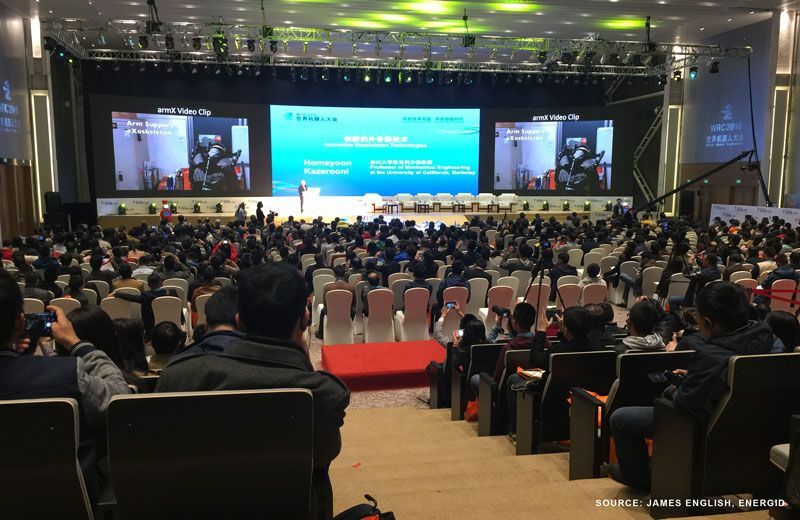 The audience consisted of business executives, government personalities, academics of all types and from all across China, Korea, Japan and the EU, robot manufacturers and their sales staffs, and, particularly on the weekend, whole families – from children to their great grandparents. A variety of contests and challenges focused on young people peppered the event: an unmanned driving challenge, an underwater robot competition, a RoboCup Challenge of robots playing soccer, and a youth challenge to work with other kids to get a robot to shoot hoops. There was even Star Challenge, a reality show about robotic startups and their key people, that will soon be broadcast on Chinese satellite and network TV. Most of the WRC reviews that appeared in Chinese and international media emphasized the abundance of human-like robots such as JiaJia, a super realistic robot capable of micro facial expressions and basic conversation, from the University of Science and Technology of China. She was the media hit as can be seen in this video which shows JiaJia, an old man in traditional Chinese clothing drawing Chinese characters with a brush, and a few other mobile robots. Other media showed a man flying a bionic butterfly drone, a badminton-playing robot that took on the crowd, and SmartTuna, a swimming industrial robot that finds leaks inside underwater pipelines which swam through clear plastic pipes for all to see. Business executives from companies that were users or candidates to use robots in their businesses were exposed to a wide range of applications and uses throughout the conference and by demonstrations on the exhibition floor. The conference program was forward-looking and addressed subjects such as Russian and Israeli co-operative partnerships, healthcare and surgical developments, collaborative robots, self-driving vehicles, drones, and research challenges that must be met for the industry to progress and succeed. About 40% of the robots on display at the show were industrial, while the rest were service and specialized robots. According to the China Robot Industry Association, 68,000 industrial robots were sold in China in 2015, up 20% compared to the same period of 2014. China accounted for about a quarter of robot sales globally in 2015, making the country the biggest market for industrial robots for three consecutive years. 32,996 industrial robots were manufactured in China last year, up 21.7% year on year. 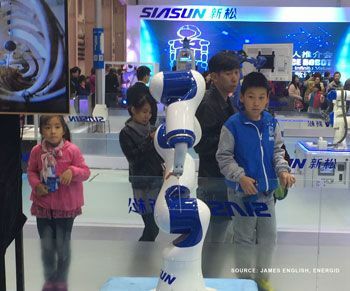 China has set goals to be able to make in-country 150,000 industrial robots in 2020, 260,000 in 2025 and 400,000 by 2030 and Shenzhen-based Siasun Robot & Automation, China’s largest domestic robot manufacturer, had the largest exhibition space to show their full range of robotic products. In April, the Ministry of Industry, the Development and Reform Commission, the Ministry of Finance and other ministries jointly issued a development plan for the next 5 years which included these goals and stressed the need for service robots as well as industrial ones, hence the emphasis at the show and in the conference program of the growing importance of non-industrial robots as consumer and entertainment products, social assistants and helpers and for all manner of use in business. The Chinese government is determined to stimulate robot development in China. According to statistics released by the Qianzhan Industry Research Institute, China’s domestic robot industry in 2015 was just $243 million, albeit a year-over-year increase of 55%. 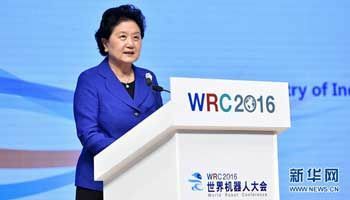 At the conference, Vice Premier Liu Yandong urged enhanced research and development of the industry. She said related policies should be improved, human resources should be developed, and global communication should be enhanced.